Last night though, I stole a Just Wave It vegetable side and figured, hey, I can make dinner and mom can make a salad (there's lettuce aplenty). And mom said it was the best dinner we'd had this week, but the vegetables needed more flavor since I took out the herb butter to use olive oil instead (I forgot about all the fresh herbs in the fridge). I dub it "Skillet Egg Pizza." 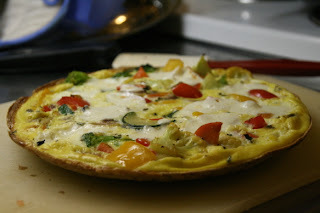 It was simple, just some assorted veggies from a container, a whole-wheat wrap, some eggs, some milk, topped with slices of fresh mozzarella.